"THE DAMBUSTERS - LAST MOMENTS OF THE MOEHNE DAM"
of The Moehne Dam during the famous "Dambusters Raid". The largest dam in Europe, the fortress-like walls of Möhne held back nearly 140 million cubic metres of water essential to the industry and factories of the Ruhr. The Air Ministry had long ago decided that if the Möhne dam, and the two other major Ruhr dams – the Eder and Sorpe – were destroyed, it could deliver a massive blow to the Nazi war machine. But cracking open the mighty dams would require exceptional flying skills; and so, on 21 March 1943, a new squadron was formed specifically for the task, the only time this ever happened in Bomber Command. Known as 617 Squadron and led by Wing Commander Guy Gibson, it was not only the squadron that was unique, so was the weapon they would be using – Upkeep – a cylindrical, hydrostatic ‘bouncing’ bomb. The brainchild of Barnes Wallis, Upkeep was designed to skip across the surface of the water, sink against the dam’s massive wall, and explode with enormous force at a precise depth. 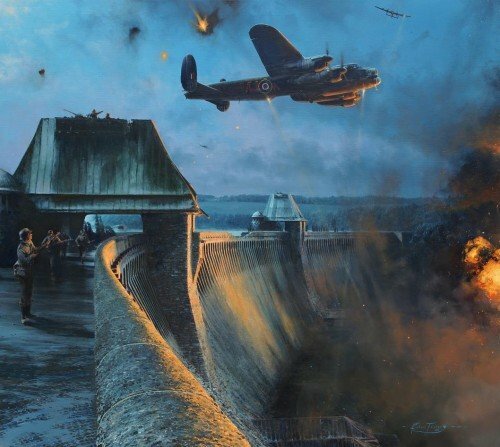 In Robert Taylor’s sensational painting Guy Gibson and Mick Martin draw the enemy’s fire as ‘Dinghy’ Young clears the dam’s parapet seconds after releasing his bomb. A few moments later Young’s bomb will successfully detonate against the dam leaving it mortally wounded allowing David Maltby in AJ-J to finish the task. With the Möhne Dam breached Gibson, with the remaining crews, will turn south to repeat the operation at the Eder Dam. Sqn Ldr GEORGE L. JOHNSON DFM RAF Served as Bomb Aimer on Joe McCarthy’s Lancaster AJ-T which attacked the Sorpe Dam. Cpl KENNETH LUCAS RAF Served as Ground Crew for 617 Sqn carrying out the special modifications to the Lancasters before the raid. Sgt FREDERICK E. SUTHERLAND RCAF Served as front gunner on Les Knight’s Lancaster AJ-N which breached the Eder Dam.